I know, I’ve been really slack with my blogging recently. I have been cooking and making notes (most of which I can still find), but I haven’t actually gotten any further than that. I’ve been a bit busy with work and study, but I will make an effort to catch up with a few posts soon! One morning recently, before heading off for a day at the beach (something else that’s been keeping me busy – the weather is bliss! ), I decided to put dinner in the slow cooker so it would be ready when we got back. I had some tandoori paste in the fridge, and some coconut yoghurt, so decided to try some tandoori vegetables. Why not, after all! A generous amount of tandoori paste, about 4 tablespoons, was mixed with somewhere between a 1 – 1 ½ cups of coconut yoghurt. Then I chopped up some veggies, keeping the pieces quite large. 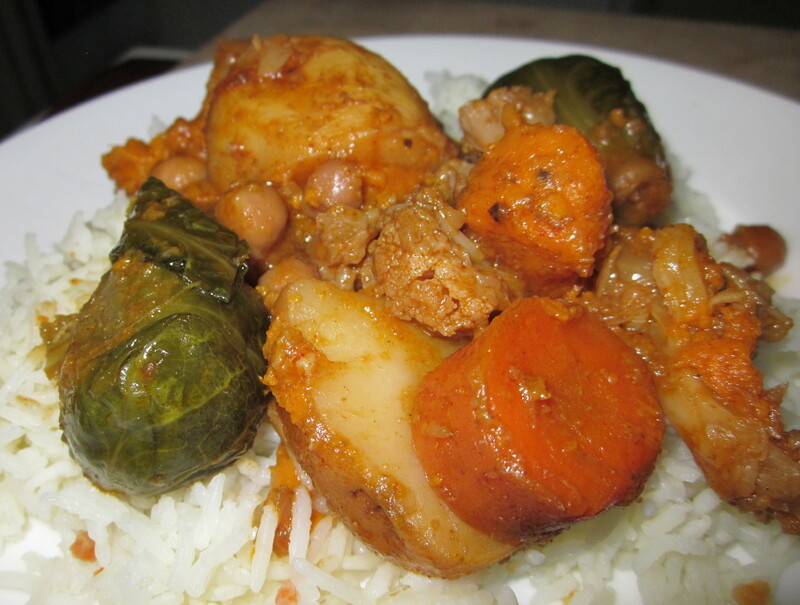 The selection I chose was potato, sweet potato, cauliflower, carrot, whole button mushrooms, brussels sprouts and chick peas. The veggies got tossed through the yoghurt mixture until they were all coated and then it all went into the slow cooker. The timer on ours only has 2 settings, 6 or 8 hours. Maybe this is standard, I don’t know as it’s the first one we’ve ever had. So I choose 8 hours as then it would be ready pretty much at dinner time. We jumped in the car with the dogs and headed off on our merry way. We spent a lovely day driving around, hanging out on the dog beach, and paddling in the water. Sadly the water was a little bit cold to really swim, not that either of the dogs is that keen on swimming, they just love running and sniffing in the sand. In fact Willow flat out refuses to go into the water, and is reluctant to even get her feet wet. She hates it when we go in the water, so one of us has to stay on the shore with her so she doesn’t freak out too much. We had a late lunch at a well-known pie shop called Humble Pie – they have a couple of vegan pies, and both kinds are really good. Then we took the scenic route home, and got back in time to have a nap before dinner, knowing we didn’t have to do anything more than cook some rice. Too easy! And though it doesn’t look all that attractive it certainly tasted pretty good! The sweet potato had almost dissolved, and the brussells sprouts were incredibly soft. It all just dissolved in your mouth.